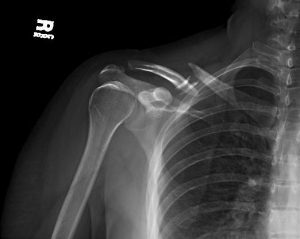 A clavicle fracture, or the collarbone, is unfortunately a common injury in contact and collision sports, such as football. Typically the injury occurs when the athlete lands on his or her shoulder. An athletic trainer or physician on the field can usually make the diagnosis right away. The clavicle will show deformity at the fracture site where the bone is often prominent or even tenting the skin. The athlete will have severe pain at the fracture site, and he will usually not move the arm secondary to this pain. Evaluation in the emergency room or in the physician’s office is critical. X-rays are usually taken to confirm the injury. 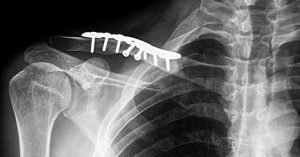 Frequently a clavicle fracture is treated without surgery. The athlete is placed in a sling to wear almost all the time initially. The sling keeps the arm from moving, and this immobilization helps to decrease the pain. As the fracture starts to heal, motion becomes more comfortable. At that point, I think it’s reasonable to wear the sling less and less to start shoulder range of motion and gentle strengthening exercises. The fracture typically heals, but it can often take 3 to 4 months before complete healing is noted by x-ray. his is a comprehensive Q&A collection on rotator cuff tears, SLAP tears, AC joint injuries, pectoral injuries, sternoclavicular joint dislocations and more.